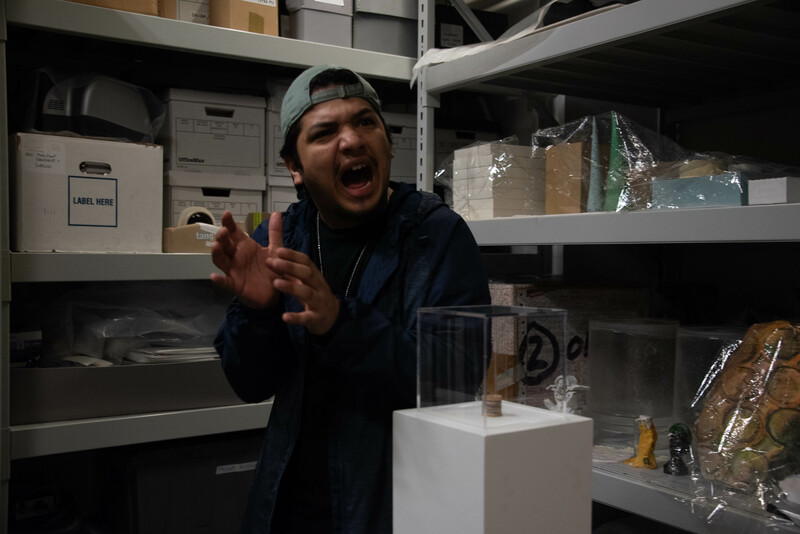 The Shelf, currently on display in the Tang Teaching Museum, explores the perhaps trivial distinction between highbrow and lowbrow art. 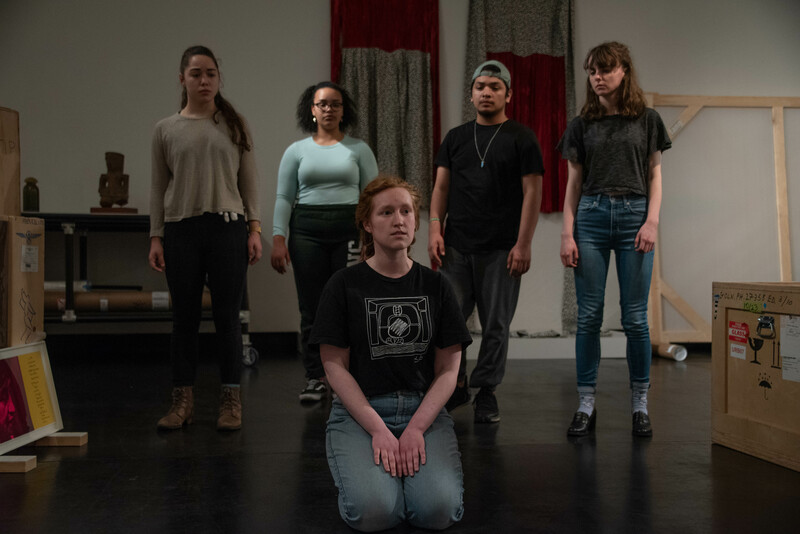 Off the Shelf, a site-based theatrical piece set to open March 27, takes this concept in stride, experimenting with the intersection between visual art and performance. 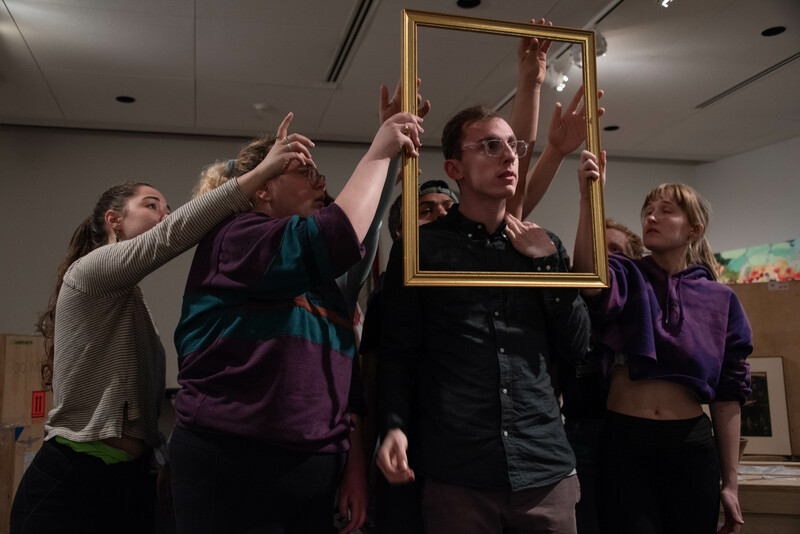 It is rather unusual for any museum to open their permanent collection for visitors, let alone a group of college actors who are going to take over the space with movement, action, and audience members. And this is not lost on the actors of Off the Shelf, who have been reminded by Tang staff members just how unconventional the situation is. Rodriguez said this is what often scares people away from devised theatre. “I think for me, it’s fun because you get — of course when you do a scripted show you get to have your own input, but you get to do it more. You get to say ‘oh, I think this would be a good idea,’ and just go with it if that works. You get to put your own touch on the show that you normally don’t get to do on a scripted show.” There is no script, perhaps only a blueprint given out on the first day. What follows must be created through trust among the students and director(s). For this piece, the actors travel from the Tang loading dock into the Payne Room, which represents a more “traditional” theatre space. Blocking and lines are made collaboratively. 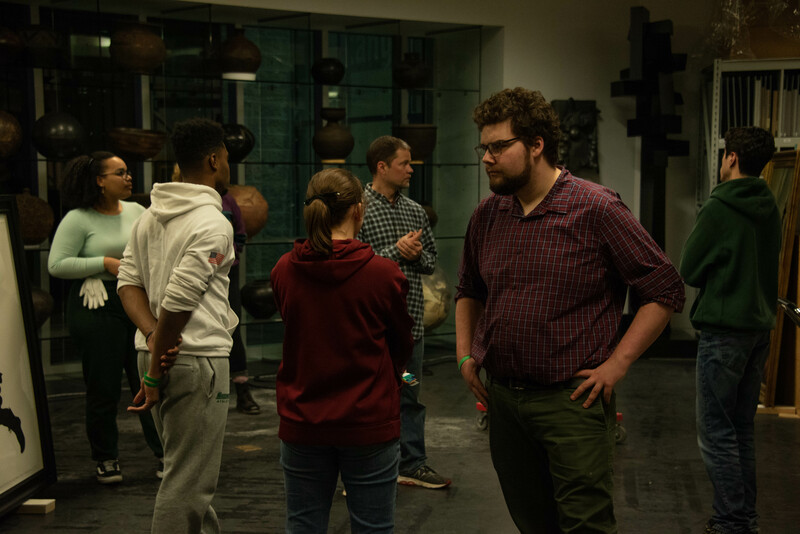 It is all up for the actors to make educated, effective choices as they move through the space, creating connections between the art pieces. 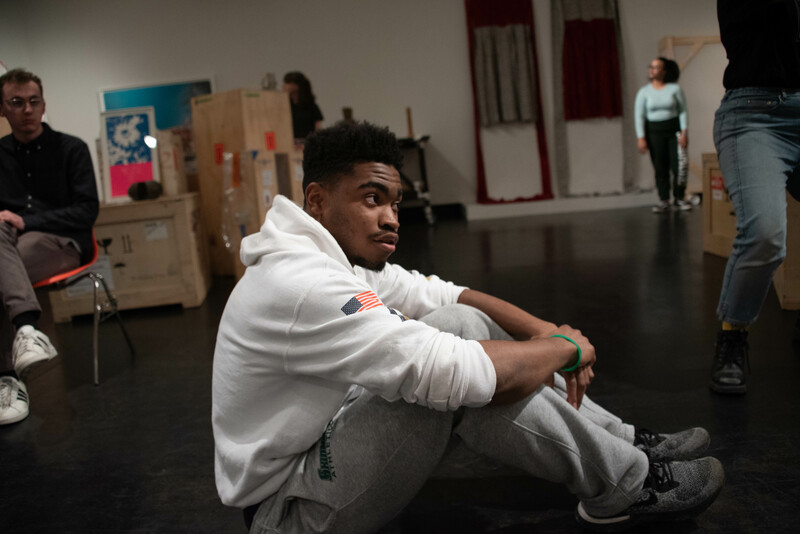 Since being cast, the students have had assignments to align their minds to the task at hand. These allowed the students to experiment with art and perspective, being given the choice to either become the art itself or remain an onlooker. They were able to create and add stories to the artwork, directly feeding into the devising process. Much of the piece meditates on how people affect the space and the artwork in it. 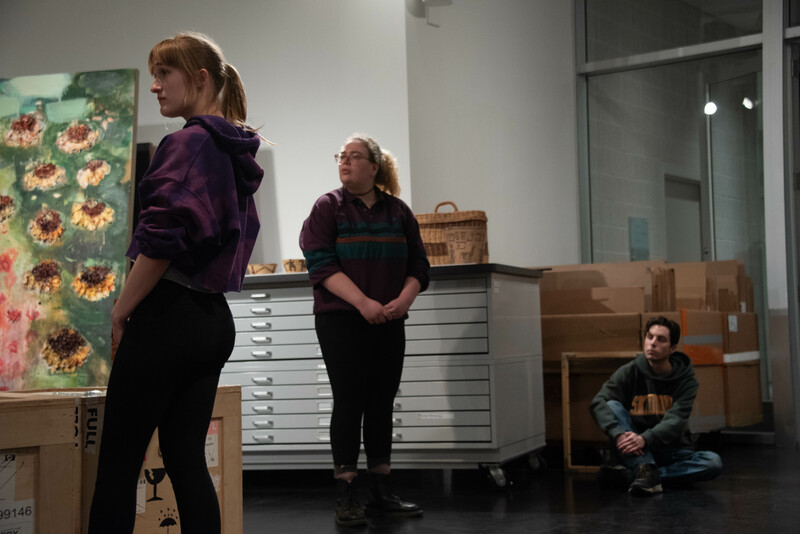 Finley Martin ’19 is a studio art major and finds her two main interests at Skidmore coming together in a big way with Off the Shelf, which has admittedly led to many “geek outs.” She described Off the Shelf as being a collection of vignettes that exist within specific sections of the museum. 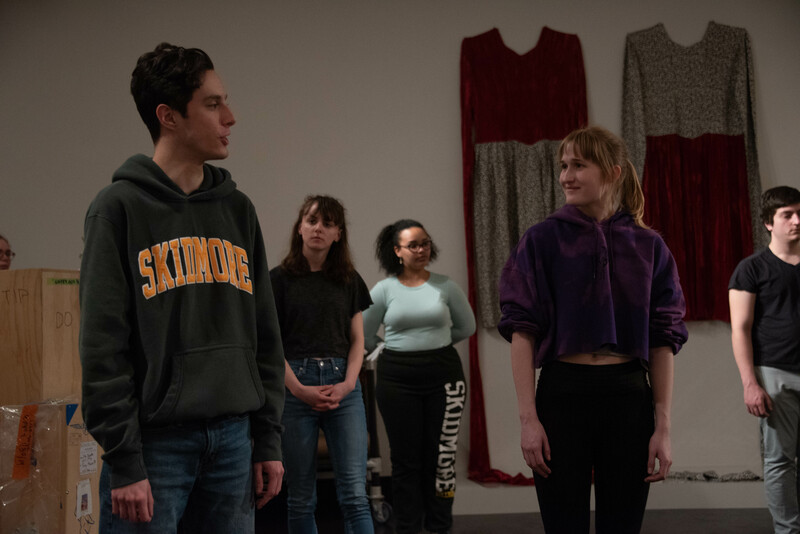 Off the Shelf‘s fast pace and innovative take on theater promises to be an unforgettable experience built upon mutual trust. Because the show relies so heavily on improvisation, the actors need to support one another and their choices. “People are going to make a weird choice every now and then, or something won’t work, but that’s almost better. You get to learn then, as long as you’re not in a group of people who will judge you,” explained Martin. Through team building exercises, the group has learned to laugh about certain choices before just moving on from them. Off the Shelf demands an unparalleled level of communication — both subtle and explicit. And after moving into the Tang space just yesterday (Mar. 18), the actors are feeling this pressure. “We had all these big grand ideas in our head but then you get in a space and you’re like ‘you can’t be there, there’s a painting that you’re going to knock over.’ I felt like yesterday we were all very nervous,” explained Martin. According to Rodriguez, the group has already been through nine drafts of the script, and received another version late last night. The changes are natural, and Rodriguez promised they will happen up to the final days. For many of the actors it can be difficult to be in a space with such expensive, treasured items while also finding an acting space. Yet this discomfort seems to be vital in the devising process. Off the Shelf opens tomorrow, Wednesday, March 26 and runs through Friday the 28th. There are two shows every night at 7pm and 8:30pm. Tickets are currently sold out, but you can view information on the show here and show up early to get on the waitlist. Jessica Pavia is a Junior staff writer with the Living Newsletter.